As humans, we are limited in the amount of knowledge that we can accumulate, access, and share. This is why we need Seshat: Global History Databank—a massive collection of information based on the collective work of thousands of scholars of human history. University of Oxford’s Dr. Harvey Whitehouse, University of Connecticut’s Dr. Peter Turchin, and University of Hertfordshire’s Dr. Pieter François make the case for Seshat in their recent article The Role of Ritual in the Evolution of Social Complexity: Five Predictions and a Drum Roll. In the piece, Whitehouse, Turchin, and François share the five predictions that will be the first tested using Seshat: Global History Databank. 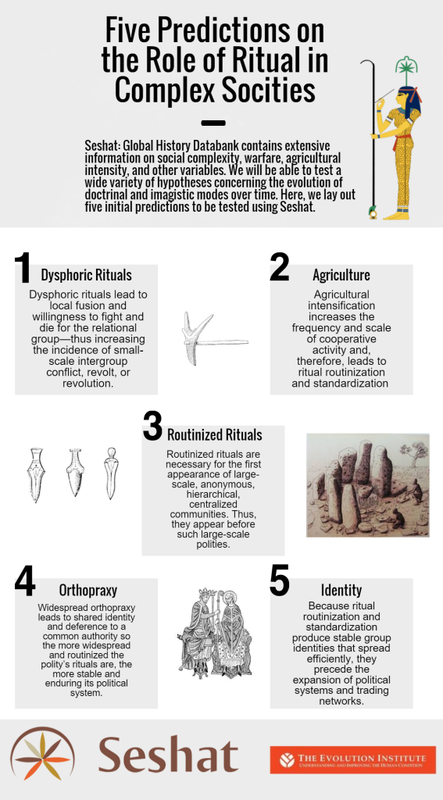 The five empirical predictions focus on the role of ritual in the evolution of complex societies and are detailed in the infographic below (click to enlarge). For an overview of these predictions, see the article in the journal Cliodynamics. These predictions are an important part in the creation of a scientific approach to history, and will allow Seshat experts to avoid accusations of cherry-picking examples to fit their arguments.